Being a student living away from home you have to fend for yourself and making sure your eating right can be hard. It’s so easy sometimes just to stick that meal in the microwave or head to McDonalds instead of cooking but well lets face it your body won’t thank you for that in the long term. Along with this you have to take cost into account because as a student you are nearly always ‘broke’ and so you need to look for healthy nice food that doesn’t cost a fortune and well I think I have an answer with this recipe. Here in France not only do I have think about the cost but I also have to think about my limited cooking space, when I saw limited I really mean terrible. We only have 2 microwaves and 6 cooking hobs between 30 people on a floor so something that is easy for me to make with these tools but is also somewhat healthy was hard at first but I think I finally have the hang of it now. 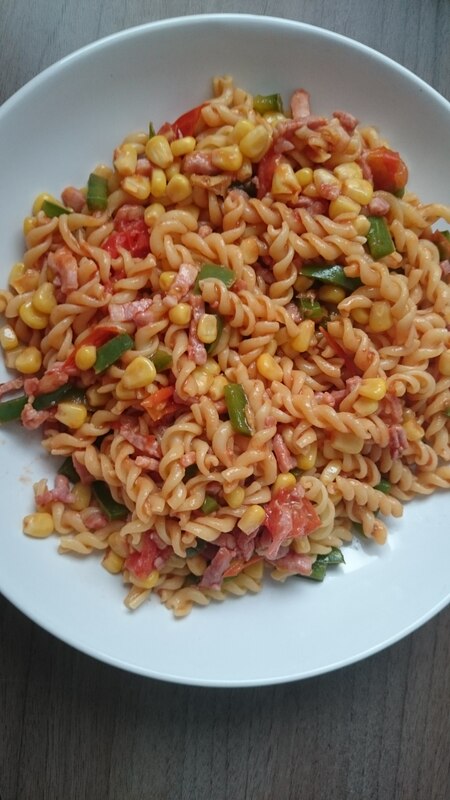 Pasta with Lardons and Vegetables. 2. Heat up a frying pan and put your lardons in and cook until they are cooked through. 3. Add your chopped pepper and cherry tomatoes. Cook until tomatoes start to go soft. 4. Drain sweetcorn and add to pan. Add some tomato purée to add a little bit of a sauce. 5. When pasta is done drain and return to the pot. Add the vegetable mix to the pasta and mix. This is a really quick and easy dinner that doesn’t cost much and is actually quite healthy. Sometimes I like to make a large portion of the sauce and have it in my fridge for another day, usually lasts around 2 days and then you just heat it up and add it to your pasta or whatever you want. Hope you liked this recipe and do let me know what you think if you try it. Also is you have any other quick student proof recipes let me know.